Genius/madman behind Apple Computers craves simplicity while living a messy life. Steve Jobs (1955–2011) was a co-founder of Apple Inc.
Laurene Powell Jobs becomes a steadying influence in his chaotic life. Kōbun Chino Otogawa, a Sōtō Zen priest, is Steve’s spiritual mentor. Steve Wozniak, Steve’s friend and colleague, developed the original Apple system software. Chrisann Brennan was Steve Jobs’s girlfriend when he dropped out of college—until she became pregnant. The other characters are software engineers, the media, students, friends, and wedding guests. Pivotal moments in Steve Jobs’s life on the West Coast; time is circular (think “revolutions”), rather than linear. This one-act opera, lasting about an hour and a half, explores the life of the controversial tech pioneer. Steve’s journey from hippie dropout to embattled mogul turns out to be a quest for spiritual wisdom and human connection. 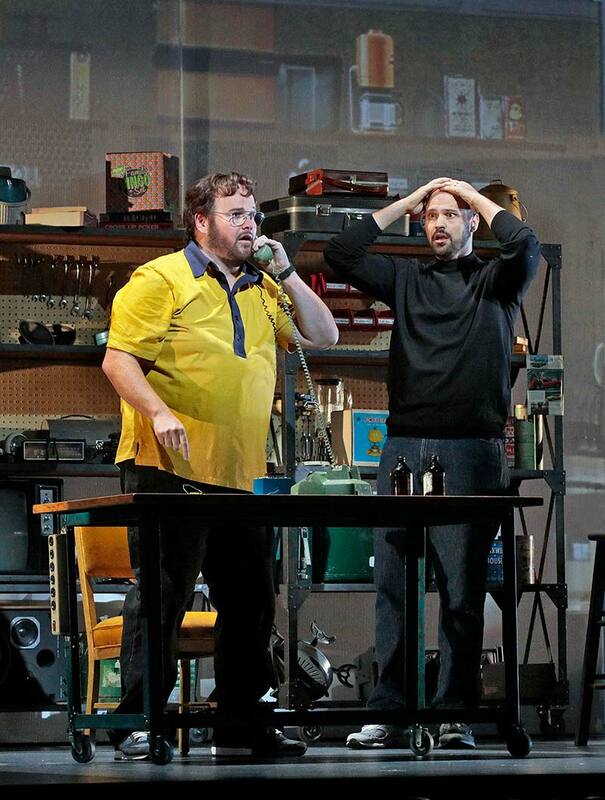 The opera follows his career from the early ’70s, when the teenaged Jobs and his buddy Steve Wozniak were playing prank calls on the Vatican while revolutionizing personal computers from a suburban garage south of the Bay Area. In the early ’80s, Steve refused to acknowledge the child he had with his girlfriend Chrisann, while making enemies at Apple who eventually forced him out. In the late ’90s, the older and wiser Steve, now married to Laurene, again became CEO of Apple and led the company through the creation of the iMac, iTunes, the Apple Store, the iPod, iPhone, and iPad. He was diagnosed with cancer in 2003 and passed away eight years later. One of the nation’s leading young composers, Mason Bates uses every tool in the modern musical arsenal to tell this compelling story of our time. In addition to an opera orchestra Puccini or Strauss might have recognized (amplified by saxophone, piano, and alto flute), Bates incorporates electronic sounds generated by computer, guitar, and an immense percussion battery including vibraphone, marimba, glockenspiel, bamboo chimes, Tibetan bells, prayer bowls, tuned gongs, wood blocks, rute, and sandpaper blocks. Sometimes his orchestra excites us with the mechanical, crushingly intense, relentlessly manic pace of modern life; sometimes the orchestra encourages us to relax, with yawning harmonics and jazzy sighs helping us stretch out and recoup after all that intensity. Bates’s quirky but engaging rhythms may remind you of Bernstein; he uses repetition both in terms of motives representing story elements (in the post-Wagner tradition) and as cells (in the tradition of America’s minimialists). Sometimes his orchestra excites us with the mechanical, crushingly intense, relentlessly manic pace of modern life. Sometimes the orchestra encourages us to relax, with yawning harmonics and jazzy sighs helping us stretch out and recoup after all that intensity. 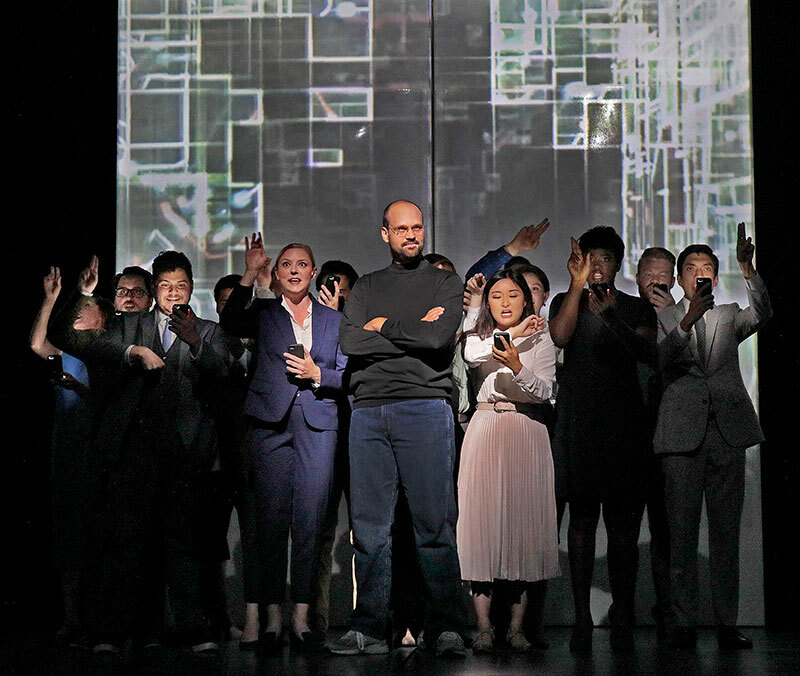 Opera stands or falls by its writing for voice, and The (R)evolution of Steve Jobs offers some of the juiciest roles for singers of any recent America opera. As Steve becomes more and more obsessed with concealing his inner chaos behind slick technological products, the truth of humanity breaks through in show-stopping arias and ensembles. Steve’s trajectory toward crisis is chronicled in Chrisann’s “I could learn to like you,” the duet “Ma Bell was just taken down” for Woz and Steve, and Steve’s own “These machines could be...”, almost a contemporary rewrite of the Composer’s Hymn to Music from Ariadne auf Naxos. Climbing back up from his downfall, Steve learns wisdom when confronted by Kōbun’s aria “Take one step,” Woz’s “Goliath,” and Laurene’s “Humans are messy.” The big climaxes of the opera come in concertante ensembles, first for the original iPhone product launch in 2007, later for the circumstances leading up to Steve being forced out of Apple in 1985. Long ago, opera composers decided up front whether they were writing tragedy or comedy, and the music made it clear which was which. Today, storytellers aspire to represent reality with a more truthful blend of funny and sad, silly and serious. The (R)evolution of Steve Jobs has plenty of laugh lines and even musical jokes. Yet its story also includes cruelty, grief, and doom. The libretto and music aspire to present life honestly, leavening a serious intent with a light touch. Santa Fe Opera, Seattle Opera, and San Francisco Opera jointly commissioned this work from Mason Bates. Indiana University is also a co-producer. 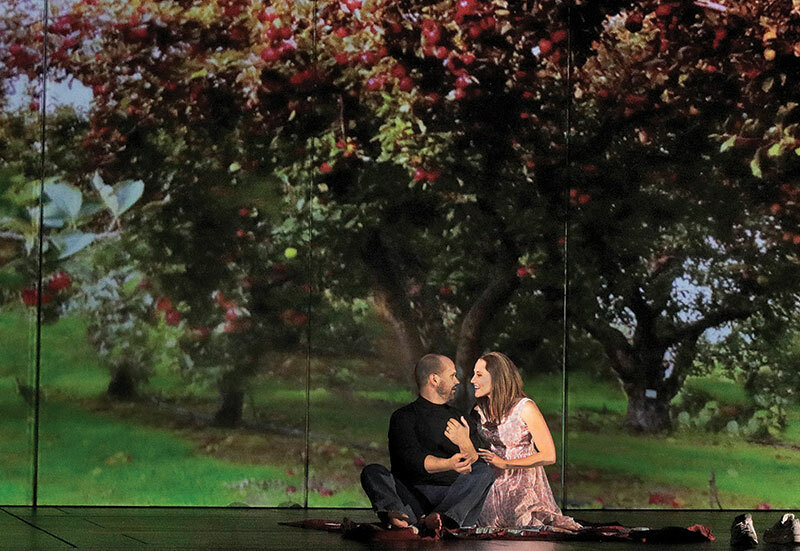 The (R)evolution of Steve Jobs was the most popular new opera in Santa Fe Opera’s history and one of the top-selling operas in the company's history. An extra performance had to be added to accommodate the demand for tickets. In May 2018, a recording of the work was issued under the Pentatone label. 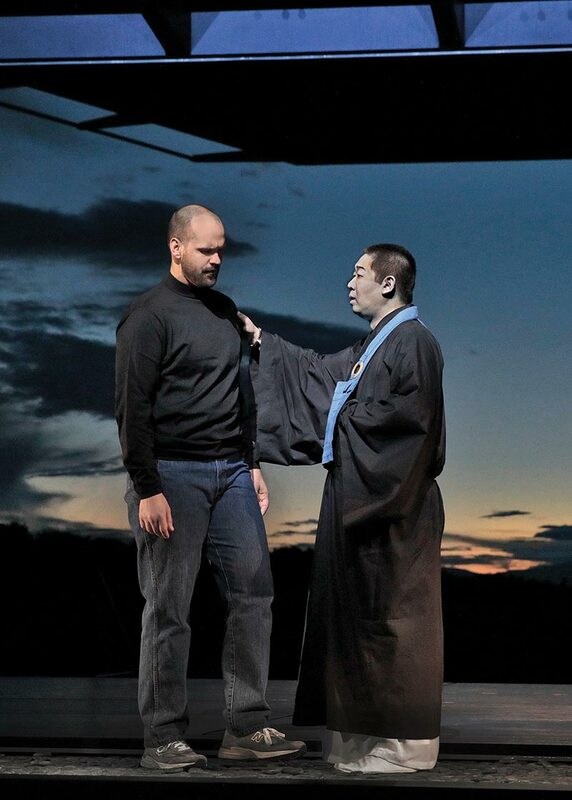 Gary Rydstrom of Skywalker Sound assisted Bates with the production of the opera’s electronic sounds, and Teah Strozer of the Brooklyn Zen Center, a student of the real Kōbun Chino Otogawa and an acquaintance of Steve Jobs, consulted with Campbell on the libretto. "The title actually refers less to the revolution Jobs helped create in technology than the kinhin of self-reflection that propels the story." Kōbun, Steve’s spiritual mentor, lives in a musical world of thoughtful reflection. This world-premiere production, which opened in Santa Fe on July 22, 2017, was directed by Kevin Newbury (whose Mary Stuart was a success in Seattle in 2016), with sets designed by Vita Tzykun (whose costumes for Semele dazzled Seattle in 2015). “My very first draft of the libretto,” says librettist Mark Campbell, “described a set design that opened the opera with the suburban Los Altos, California, garage of the Jobs family home. The four walls (front and back) ‘exploded’ into eight video screens. I was also guided by the aesthetics of Noh Theatre, and chose to include a jiutai-za, or bench, so that characters’ entrances and exits could be more fluid. Those were the basics, but it takes a genius like our set designer Vita Tzykun to transform those ideas into a workable set—one that I think would’ve even impressed the subject of our opera.” Costumes by Paul Carey, lighting by Japhy Weideman, projections by 59 Productions, and choreography by Chloe Treat complete the production.